What's a Fell really like? Our Fell ponies have been with us a long time, since before the Romans in fact, when they probably looked like Exmoor ponies - little, hairy, brown, and tough. They're a bit bigger now and show more colours but they are still hairy and tough! A classic "thumbnail sketch" given by C W Wilson in the early years of the 20th C was "a cart horse in miniature". Admirers would grimace to hear that nowadays, but that is still how the Fell pony appears to the unsophisticated eye because he is muscular, deep bodied, short legged and powerful with a trimming of hair round his feet and lower legs. But look closer and you can see he is a pony; his head and ears are small and his eyes are bright and intelligent. Willing, he is; dumb, he is not. He is nobody's fool. All his history is involved with work, and he learns it fast. Once he knows his job you can trust him to do it well. Though he may sometimes be bloodyminded he is never stupid; he is a survivor, a thinker, a quick but cautious and canny beast. He will expect you to be the same, and he may take over if he feels you are incompetent. Fells have the reputation of being "good doers". They can work all day on a small ration and they will thrive where a more highly bred animal would find it difficult just to survive. Fell owners will confirm the ability of these ponies to "stay fat on thin air" when they are kept on good going. The Fell's inherited thriftiness has been necessary to keep it alive in harsh conditions. The biggest challenge to any new Fell owner is learning how little "corn" to feed and how much rough forage and WORK it should have. 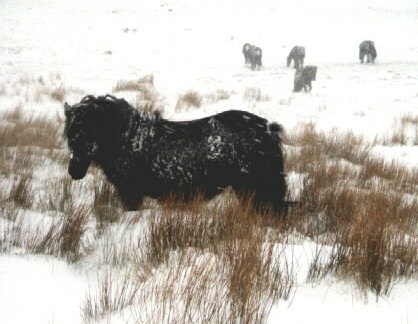 Greenholme ponies in the snow on Birkbeck Fell. They are bred to survive this kind of weather. "... It is natural to a semi-wild pony to fend for itself all day and all night, whereas the finer bred animal has been constantly cared for by man and has never known the need for alertness which is instinctive to the native pony." Because he always saves his own skin, a Fell will also save his rider in a difficult place, though don't expect him to choose a wall that is high enough to shelter you both if it starts to snow. Fells can do well in all disciplines; they are general all round ride-and-drive ponies. Ponies with a strain of Trotting Comet blood were said by R B Charlton to be faster and more willing workers. However, observation of these quirks of temperament began far back in the past, a long way beyond the Stud Book, so the only way to tell if a pony will suit your job is to study its conformation, personality and abilities in person! 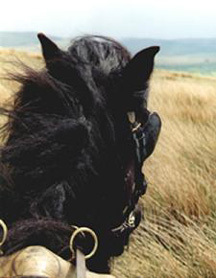 Fell ponies were known from all over the old counties of Cumberland, Westmorland, Furness, parts of Yorkshire and Northumberland, and Galloway in southern Scotland. All of these were part of the area once known as the Kingdom of Rheged. Old farmers still refer to them as Fell-Galloways. Bill Potter's foundation for Greenholme stud: 2 Heltondale mares in the late 1950s. Until the 1960s, "brown" or dark bay Fell ponies were as common as black ones (see 1913 colours of foals). Small numbers of greys were registered in the early stud books. Black did not become predominant in the Fell breed until the second half of the 20th century. 4 chestnut Fells were registered prior to the First World War; there were two or three pied or skewbalds; and occasional roans and duns persisted into the later 20th C. In 1969 the Fell Pony Society News reported that blue and red roan ponies were still occasionally foaled in Mr W Winder's herd at Caldbeck; 8241 Mountain Gipsy by Mountain Jester 1409, was red roan. She threw blue or red roan foals although put to a black stallion. 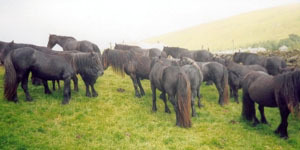 Solid coloured ponies, bay or black, occasionally show white flecking or "ticking", with single white hairs showing on the flanks and/or tail head, which is unrelated to ageing. 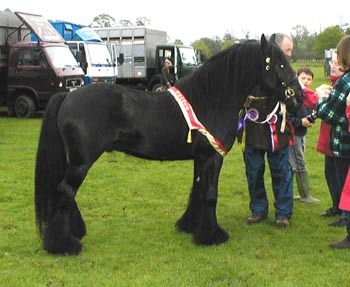 Some of the Fell pony men in the 1980s and 1990s preferred a dark brown pony (almost black with tan muzzle) because they said it could not be beaten for hardiness. "Them broon 'uns are bad t'kill on t'fell!" 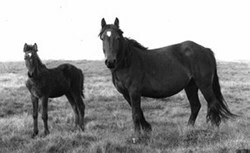 Liver chestnut Fells have occasionally been bred in more recent times, but not registered. Since 2006 they may be registered in Section X of the Stud Book, for foals that have pedigree parents but do not conform to the breed standard. The common belief that all Fells are black is not true. There are excellent ponies in all the Fell colours; black, brown, bay or grey. Black did not become predominant in the Fell breed until the second half of the 20th century. Before that brown (or dark bay) was as common as black (see 1913 colours of foals) although some breeders concentrated solely on blacks. 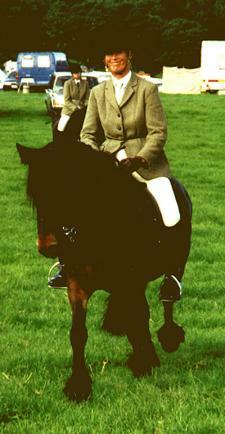 Lunesdale Rosebud, a dark bay mare, was shown in 2000 by Julie Robinson, based at Killington. When you compare modern Fells with photographs of their late 19th Century predecessors you can see they are now more heavily feathered around the legs and feet, and have less steeply sloped quarters and shoulders. Breeders say that some modern ponies show more bone but they are reserved about its quality; older ponies are said to have had flatter bone, clean and flinty. Roman ponies however are unlikely to have been as big as the modern Fell. Even those bred in the early 20th C are often smaller in relation to their handlers, than are modern ponies. Today's "show" Fells often look more thick in the body, but this is generally only a difference of fat covering. The ponies now often run on better, smaller, grazing areas and expend less energy getting their food. Most modern animals will also be doing far less work than the stock in early photographs. The Fells' work today is still as varied as their history. 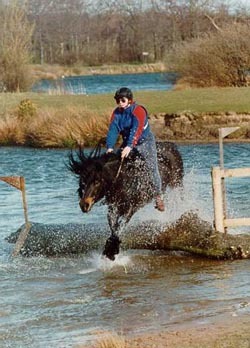 They are popular for pony trekking in the Lake District, but they can do much more. 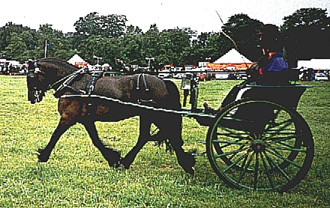 The Duke of Edinburgh drives competitively with a team of four Fell ponies. Her Majesty the Queen has owned and ridden and driven Fells since she was a young woman and she also breeds Fell ponies which carry the “Balmoral” prefix. Partly because of this Royal connection, Fells are popular with people taking up driving. Jossgreen used to go round the jumps in her field practising without a rider; but Swindale Rose even in her youth preferred to cross any obstacle one leg at a time, thank you! If you are looking for a strong, working pony that will carry Grannie, Mum or a competent child equally well, without costing much to keep, you certainly wouldn’t go far wrong with a Fell.